Losing weight can be a complicated process filled with questions. Will this food help me burn fat? Is that going to stall my progress? Fortunately, most of your weight loss questions will be answered when you eat the right foods. What exactly do I mean by the “right” foods? You may think they are the foods that make you burn a significant amount of belly fat. However, these foods don’t exist. The only way to legitimately accelerate fat loss with food is to consume foods that help you maintain a calorie deficit without feeling fatigued, unhealthy, or hungry. A true “fat loss food” is a food (or beverage) that has one or more of the qualities that we will take a look at below. What Is a “Fat Burning Food”? Just by searching online for “fat burning foods” or “foods for fat loss,” you will find dozens of articles with a variety of different comestibles, but rarely will the authors tell you the qualities that these foods have in common. They are highly-satiating despite being lower in calories compared to other common foods. They increase your calorie burning more than most calorie sources. They reduce calorie consumption by triggering satiety. They improve gut health (which is associated with fat loss). They increase energy levels without adding too many extra calories to your diet. They promote ketosis (which will help reduce hunger and decrease calorie consumption). In general, if a food or beverage has one or more of these characteristics, it will probably be found on one of the dozens of “fat burning foods” or “fat loss foods” lists. When your diet consists primarily of these foods, your chances of reaching your weight loss and health goals will increase significantly. However, many of the most popular “fat loss foods” are not keto-friendly (i.e., they make it harder for you to enter/maintain ketosis). For those of you that want to stick to the keto diet and reap all of its benefits, I recommend adding some of these keto-approved foods for fat loss to your diet. Below, you can use the visual guide to see some of the best foods for fat loss on keto. Scroll down to see specific examples and links to recipes where you can incorporate more of each ingredient into your diet. Despite being high in fat, nuts are not as fattening as you would expect. Studies have shown that eating nuts can improve metabolic health and even promote weight loss. This is primarily due to the fact that they contain plenty of fiber, which increases our feeling of fullness and reduces calorie consumption. Although all nuts are low in net carbs, the amount varies quite a bit among the different types. Leafy greens like kale, spinach, collard greens, and Swiss chard are chock-full of nutrients and iron. They also are packed with fiber, which will slow the digestion process and cause you to feel more satiated with fewer calories. Need more keto-friendly veggie ideas? Check out our low-carb vegetable guide. Getting enough greens is crucial for your keto diet success. Anytime you see a food item that is packed with protein, think to yourself: “this will help me lose weight.” Eggs are one high-protein food that provide us with plenty of evidence to back up this rule. Just one egg yolk contains thirteen essential vitamins and minerals and the eye-protecting antioxidants known as lutein and zeaxanthin. They are also one of the best sources of choline, a vitamin-like essential nutrient and methyl donor involved in many vital physiological processes. In general, studies on egg consumption found that these nutrient powerhouses increase the feeling of fullness and keep blood sugar levels stable, leading to lower calorie intakes for up to 24 hours. This could mean that eggs are the weight loss boosting superfood you’ve been waiting for. Protein powder is technically not a “food,” but you can use it as a compliment to your meal as you would use any other high-protein meat. The best part about protein powder is that you can get all of the benefits of protein without any extra carbs, fat, or calories — as long as you pick a protein powder with no other additives. Protein reduces levels of the hunger hormone ghrelin, while it boosts the appetite-reducing hormones GLP-1, peptide YY and cholecystokinin. This leads to a spontaneous reduction in calorie intake. About 20-30% of protein’s calories are burned while the body is digesting and metabolizing the protein. Increasing your protein intake can make you burn roughly 80-100 more calories per day. High-protein diets are highly satiating, so they lead to reduced hunger and appetite compared to lower protein diets. This makes it much easier to restrict calories and lose weight. Eating more protein can lead to significant reductions in cravings and the desire to snack during the day and night. Eating more protein can help you gain or sustain your muscle mass, which will help you burn more calories and improve metabolic health. Altogether, increasing your protein intake is one of the best ways to make losing fat much much easier. Just make sure you don’t have so much that you keep yourself from ketosis. When it comes to purchasing the best protein powder, I recommend keeping it simple and finding something that has virtually no carbs or fat — and if it does have fat, make sure it is derived from MCTs. 100% grass-fed whey protein or casein protein are great options for anyone who isn’t sensitive or allergic to dairy protein. 100% grass-fed collagen powder is another excellent option if you want to reap some of the unique benefits that you will find in this article. Moreover, if you are trying to cut down on animal protein for any reason, I recommend searching for a low-carb vegan protein powder like pea protein. Many studies indicate that maintaining a healthy bacteria balance in your gut can improve your gut health, which in turn may help reduce fat mass and inflammation. Fermented foods that have both good bacteria and prebiotic fibers, such as Kimchi and sauerkraut, are helpful in ensuring that your gut is healthy. The main ingredient of both Kimchi and sauerkraut is cabbage — a leafy green vegetable that is rich in antioxidants, prebiotic fiber, and vitamin C but extremely low in calories (just 22 per cup). In other words, whether you have cabbage fermented or in another preparation, you can eat it too your heart’s content. If you are not familiar with Kimchi, it is a spicy Korean condiment provides us with an excellent source of fiber and vitamins A, B, and C. Because it is fermented (like sauerkraut), kimchi contains tons of probiotics that help heal your gut. *Use store-bought Kimchi or sauerkraut without added sugar instead of cabbage or quick Kimchi for a good dose of probiotics. Garlic has been used for centuries as a prophylactic and treatment for many diseases. It is rich in organosulfur compounds, which give it its potent flavor, taste, and health-promoting properties. A recent randomized, double-blind, placebo-controlled trial found that subjects who received 400 mg garlic powder tablets twice a day lost significantly more fat than the control group. Although there are many confounding variables in this trial, animal studies back up the human findings by providing us with evidence that garlic supplementation can have anti-obesogenic effects (i.e., garlic prevents weight gain) in mice. No, you’re not seeing things — an average everyday condiment made the list. Although mustard does not have any magical fat-burning properties, it still made the list because it packs a tasty punch without adding too many extra calories. By using this condiment to replace other higher-calorie dressings and sauces, you can help boost your fat loss results without missing out on flavor. Another super low-calorie condiment that you can use to replace higher calorie additions is vinegar. Several human studies also suggest that vinegar can be useful for weight loss in other ways as well. One 12-week study on obese individuals, for example, showed that the consumption of 15 or 30 ml of vinegar per day caused weight loss of 2.6–3.7 pounds (1.2–1.7 kilograms). The researchers of the study indicated that vinegar’s ability to increase satiety may be the mechanism behind these results. Chicken is one of the highest protein, lowest calorie foods you can eat (depending on what type of chicken you get). This means that you can reap of the fat loss benefits of protein (that we discussed in the protein powder section) by just tossing some chicken in with your keto meal. To ensure that you are eating chicken that is best for you and the environment, make sure you are purchasing pasture-raised chicken from farmer’s that raise their hens in a healthy and sustainable way. “100% vegetarian-fed”, “cage-free,” “free range,” and “omega-3 enriched” are simply marketing terms that indicate nothing about how healthy the animals were that your chicken came from. The healthiest chickens are those that have been given the opportunity to roam freely throughout the day, eat plenty of bugs, and soak up the sun. This is technically a group of foods, but I couldn’t resist putting them all together for one reason — they all provide us with a source of sulforaphane and fiber. You already know about how fiber can help increase our feelings of fullness but have you ever heard of sulforaphane? Sulforaphane is a compound that is created when we crush or chew cruciferous vegetables. Once it is digested, sulforaphane activates a cytoprotective (cell-protecting) pathway that protects the cells from oxidative stress and removes toxins from the body. What is also incredible about this compound is that experiments with mice found that it helps reverse obesity. How is this possible? Because sulforaphane help increases the amount of energy-burning brown fat and improves gut health. Both are linked to lower levels of obesity and better overall health. If you want to get as much sulforaphane as possible, I recommend adding broccoli sprouts to your diet. Feel free to sprinkle them on top of your keto meals; especially meals that already have some cruciferous vegetables in them. Olives and olive oil contain numerous health-promoting compounds. One of their most studied compounds is called oleocanthal, which has anti-inflammatory properties that rival ibuprofen’s effects. Studies indicate that olive oil can help increase fat loss and promote lean body mass preservation as well. The combination of the healthy fats found in olive oil and its anti-inflammatory properties are the primary reasons why this fatty food can help make you thin. Eating chili peppers may be a helpful addition to a weight loss diet. Each chili pepper contains capsaicin, a substance which has been shown to reduce appetite and increase fat burning in several studies. For example, one study showed that eating 1 gram of red chili pepper reduced appetite and increased fat burning in people who didn’t regularly eat peppers. 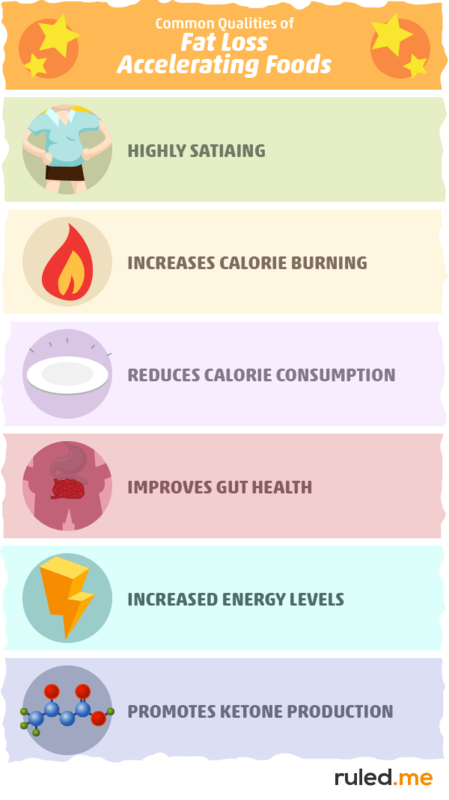 However, there is evidence that people who are accustomed to eating spicy foods may build up a tolerance, consequently creating less of an appetite reduction and fat burning effect. In other words, those of you who love spicy foods may have to raise the stakes a bit to reap the fat loss benefits of chili peppers. Avocados are an essential part of the ketogenic diet, especially in the beginning. This is because these fatty fruits are high in several vitamins and minerals, including potassium. For this reason, increasing your avocado intake may help relieve many of the symptoms of the keto flu during the first few days of keto. When it comes to fat loss specifically, avocados are one of the healthiest and filling keto foods you can eat. About one-half of a medium avocado contains nine grams of carbs, but seven of these are from fiber. On top of that, avocados have a relatively high water content. Altogether, the fiber and water from the avocado will increase the bulk in your stomach and small intestine, triggering increased satiety with fewer calories. This childhood favorite is great for your grown-up self too! Since peanut butter is an excellent source of protein and healthy fats, it can curb hunger and keep you feeling full long after you’re finished eating. Research also suggests that eating peanut butter as part of a healthy diet could benefit your heart (and it may even lengthen your life). Just be sure to read the nutrition labels on the jar carefully, and choose a brand that doesn’t have any added sugar. The healthiest peanut butter will consist of only two ingredients: peanuts and salt. This guilty pleasure may be as pleasureful for you as it is for your body. The cocoa in dark chocolate contains many flavanols that improve digestive health and decrease blood pressure, heart disease risk, and insulin resistance. Altogether, this will help prime your body for fat loss and improve overall health. However, this doesn’t mean that you have a free pass for eating as much dark chocolate as you’d like, especially if you are on the ketogenic diet. Many chocolate products contain enough net carbs to kick you out of ketosis. When buying chocolate or any cocoa product, read the label to make sure it has no added sugars and a negligible amount of carbs per serving. If you don’t like the taste of dark chocolate, then look for chocolates that derive their sweetness from healthy low-calorie sweeteners. Most fruits are too high in carbs to include as a part of the ketogenic diet, but some berries are a delicious exception. There are hundreds of types of berries in the world, and all of them contain different anthocyanins, which are flavonoids responsible for their distinctive colors of red, blue, and purple. These flavonoids also have potent anti-inflammatory effects and can improve gut and brain health. And don’t forget about their sweet and tangy taste! Just a couple of berries may be all you need to curb your sugar cravings, so you don’t succumb to your urge to binge on sweets. While you are on the ketogenic diet, however, it is best to consume berries in moderation due to there relatively higher net carb content. The primary antioxidant in green tea — EGCG — is linked to potential weight loss benefits, and matcha has more of it than regular green tea. Several studies indicate that EGCG increases fat oxidation at rest and during exercise. In other words, green tea — matcha green tea in particular — can literally help you burn fat. The caffeine in matcha green tea will also help increase fat burning, ketone production, and overall calorie burning. How much fat loss caffeine and EGCG will stimulate is uncertain, but there is reason to believe that they will help any dieter boost their results. Coffee will provide you with many of the same benefits as matcha green tea, but without an extra fat-burning boost from EGCG. Increased ketone production by 88-116% for up to four hours after drinking it. Stimulates the breakdown down fats in the body and increased free fatty acids (FFA) in the blood, which the liver converts to ketones. Increases our rate of calorie burning. Altogether, these findings translate to appetite reduction (from the ketone production) and increased fat and calorie burning. If you want to optimize these fat loss effects, try drinking your coffee black (i.e., with no added calories). Not only is hard cheese filled with highly-satiating protein and fats that help with weight loss, but studies have also found that the calcium from dairy may help increase the amount of fat you burn and excrete. This means that when you indulge in some high-fat cheese, you may be able to boost your metabolism and get all of the satiating effects of cheese without absorbing all of its calories — a win-win situation for weight loss. There is no need to be cheap with the cheese on the ketogenic diet either. Due to the low carb content of most cheeses, you can usually get away with adding it to every meal. Not only does beef provide you with plenty of protein (and all of its benefits), but it is also a good source of vitamin B12, a highly-absorbable form of iron, creatine, and taurine as well. To maximize the health benefits you get from your beef, it is best to have 100% grass-fed, pasture-raised red meat. Meat from animals that are raised in this way has been found to have healthier ratios of omega 3 to omega 6 fats and contain more antioxidants than 100% grain-fed animals. Although you can get some omega-3s (DHA and EPA) from grass-fed beef, no other food can compete with the DHA and EPA that you’ll get from fish and shellfish, especially salmon. These fats are known to decrease inflammation and may even increase fat loss, according to a few studies. Selecting protein sources that are rich in omega-3s (like salmon) instead of those that contain lots of saturated fat (such as red meat) could also help reduce visceral fat in your belly. Whether the salmon you purchase is wild-caught or farm-raised, make sure it was caught/produced sustainably and humanely. If not, you will be eating nutritionally inferior fish that is contributing to environmental issues like pollution. What’s fascinating about coconut oil is that it contains fats that help promote fat loss. One study, in particular, found that supplementing the diet of obese men with two tablespoons (30 ml) of coconut oil per day led to an average loss of one inch from their waistlines. These promising results can be explained by the medium-chain triglycerides (MCTs) found in coconut oil. Unlike long-chain fats that you’ll find in fatty meats and dairy, MCTs are taken up directly by the liver and converted into ketones and/or used as a rapid source of energy. For this reason, MCTs and coconut oil can help decrease calorie consumption and increase energy levels, which both help us burn stored fat. At first glance, chia seeds may look like they aren’t keto-friendly because they contain 12 grams of carbohydrates per ounce (28 grams). However, 11 grams of the 12 are actually fiber. This makes chia seeds one of the best keto-friendly sources of fiber in the world. Because of their high fiber content, chia seeds can absorb up to 11–12 times their weight in water, turning gel-like and expanding in your stomach. This means that adding chia seeds to your meal or having a chia-based snack is a great way to make your meal more filling while minimizing your calorie intake. Shirataki noodles are the closest thing to keto pasta that I’ve come across. They are primarily made up of a viscous fiber called glucomannan and contain less than 1 gram of carbs with only five calories per serving. Despite their low-calorie content, the fiber and water in the shirataki noodles make them very filling. They also can make you feel fuller for a more extended period of time because the fiber slows down the movement of food through your digestive tract. These unique qualities are what make shirataki noodles ideal for anyone who wants to cut their calorie consumption and lose more weight without starving themselves. Almost every yogurt you find in the store is not keto-friendly. Even plain, whole milk yogurt comes with 11 grams of net carbs per cup. However, the probiotics and fats found in yogurt make it a great food to help with fat loss and overall health, so what are you supposed to do to get your yogurt fix when you are on the keto diet? Try having coconut cream yogurt. There are some coconut-based yogurts that you can find in health food stores, but many of them have added sugar so make sure you read labels carefully. The only coconut yogurt I know of that is keto-friendly is our Coconut Cream Yogurt recipe. By making the yogurt yourself, you can guarantee that you will get the ketone-boosting benefits of MCTs from the coconut milk and the probiotics from the yogurt without any added sugar. Now you are probably wondering if particular foods that are not on this list will also help you lose weight. However, there is a flaw in this reasoning that we must point out before we move on. Technically, you can eat any food and lose weight. The key to weight loss is not eating “fat burning foods,” the key to weight loss is a sustained calorie deficit. When you are in a calorie deficit (i.e., eating fewer calories than you need to maintain your weight), your body will be forced to use its energy stores, which includes glycogen (stored sugar) and body fat (stored triglycerides). As you sustain a calorie deficit over time, you will steadily burn more and more fat, getting closer and closer to your body composition goals. Theoretically, this means that you don’t have to eat any of the foods on this list to burn off your fat. However, by including these keto-friendly “fat loss foods” in your diet, it will be much easier for you to decrease calorie consumption and lose weight naturally without having to struggle with health issues or hunger. The food is highly-satiating despite being lower in calories compared to other common foods (i.e., the food is high in fiber, protein, and/or water content). The food or beverage helps increases your calorie burning more than most calorie sources (e.g., caffeine, MCTs, high-protein foods, and chili peppers). The food improves gut health, which is associated with fat loss (e.g., fermented foods, high fiber foods, and plant foods). or beverage increases energy levels without adding excess calories (e.g., caffeinated beverages). The food or beverage promotes ketosis, which will curb hunger even more (e.g., caffeinated beverages and MCTs). If the food or beverage in question has one or more of these qualities AND is low in net carbs, then you are consuming a keto-approved fat loss promoting food. However, as with any other source of calories, you can still gain fat as a result of consuming many of these foods without following a properly formulated diet and lifestyle weight loss plan. One of the most effective diets for fat loss is the keto diet. 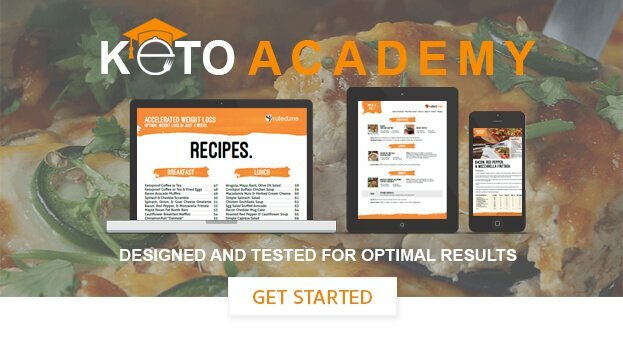 If you would like to give keto a try, check out our free guide to keto.